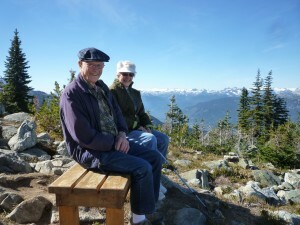 My parents, hiking on Whistler Mountain on Mom's 90th birthday. To keep healthy bones and avoid osteoporosis, we’re always being reminded to be active on our feet in weight bearing activities which help remind our bones to stay strong. Here's an eye-opening article from the New York Times, by Gretchen Reynolds, about the reduced amount of time that women spent on their feet doing housework in 2010 as compared to 1965. (Sorry, no data on men and housework!) I thought of my mother, always in motion, taking care of a family of six. Many of the household conveniences that we take for granted today weren't available when my parents were first married. In 1945, their first apartment in Seattle was heated by a coal burning cook stove, which also heated the hot water. The fridge was an icebox. Carting coal and a fifty-pound block of ice every other day was part of their weekly routine. My dad said that it wasn't so bad, considering the alternatives of not having a home or living with relatives. My parents, now in their early nineties, have always stayed active. That could be why, along with some good luck, that they are alive and well today. This got me thinking about an episode on the TV show, 20-20, when Barbara Walters and Hugh Downs reported on a 1992 study of centenarians by a Dr. Miller (never got her first name!). I was lucky to hear a talk by Dr. Miller in 2006 where she told the story of that study. She had applied for a federal grant with a goal of finding 100 centenarians, “cognitively intact and living independently.” The government said that she wouldn't find them. She did and 80 completed her study. One of the four main traits that were common to the group was being active and staying mobile. They chose to do things in a more physical way, eschewing some modern conveniences. The range in mobility was huge, from a man who swam a mile in the Atlantic to a wheelchair bound woman who made a circuit in her mobile home, completing it 15 times a day. She felt that in order to keep moving, she had to make herself move to live. Their examples keep me inspired to move! Here are my notes from Dr. Miller's talk about the other traits that the study participants had in common, besides being active and mobile. Optimism. Think positively. Found that it can be learned. Absolutely no depression or bitterness. Engagement. Passionately involved with something. A reason to get out of bed in the morning. Sense of purpose. Some were on boards at their church. For many women, it was family. One woman taught the exercise class at her senior center! Ability to adapt to loss and stay cheerful. They lose a lot. This is huge. Most had outlived their spouse, children, siblings, parents, and peers. Dr. Miller couldn't scientifically quantify it, but she would add a 5th trait: A sense of humor. The study took place in the southern U.S. Subjects were mainly from Georgia and Florida. Educational status not a factor in her study. Diet: They eat what they want. Often high calories and fat, but didn’t overeat. For many, a southern diet of meat, potatoes, and greens. No restaurant or processed foods. Many came from an impoverished, rural existence. Still chose to do things more physically, not using more modern conveniences. Few regrets. Found a way to make peace with their lives. Little fear. Didn't ruminate. I look at these notes, often. So inspiring! I enjoyed reading your blog and thought how good I feel when I make the decision to get up and exercise. Today I went x-country skiing and then shoveled a friend’s sidewalk.If I keep moving and exercising, maybe I’ll look as handsome, healthy, and happy as your parents do when I’m ninety! My parents say that staying active is the key to their longevity. Going up and down their stairs many times a day, plus regular walking up and down the hills in their neighborhood keeps them out of, “The Home,” as they say! I’m so glad that you enjoyed it! Those 5 traits have sure helped guide me over the years. What a lovely, inspiring article. And how surprising that they eat pretty much what they want! But, they don’t overeat. And they prepare the food themselves. That’s incredible. Yes, that is incredible, Susanna! It’s exactly how my parents, who are in their nineties, have always eaten. However, my dad is not wild about greens like they are in the South. But, he’s fine with just about any other vegetable. Nice to hear from you!